One of my lovely work colleagues was off to a Blitz Party the other week, and asked if I had anything that she could borrow. She had the dress and the shoes, but not the accessories. 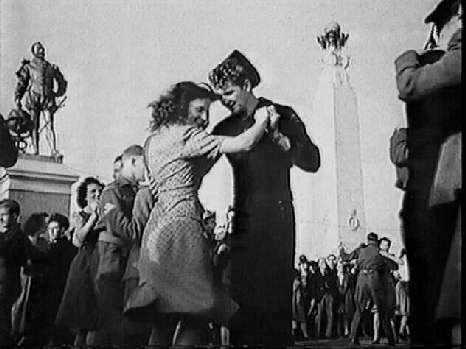 At a Blitz Party, everyone dresses up in Allied uniforms / glamorous 40s-style frocks, disappears into an “underground shelter” and bops around to a swing band like there’s no tomorrow. 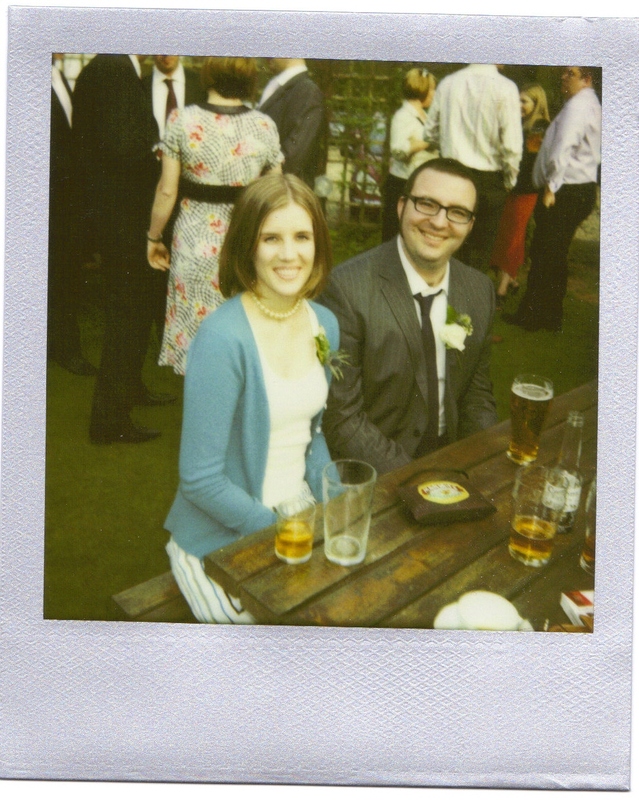 As it happened, I had a couple of pieces of vintage jewellery that fitted the bill. I don’t wear my jewellery often enough, so I thought I’d show them on here before I put them away again. This bracelet spent about 50 years in Frugal Grandma’s jewellery box. Isn’t it pretty? You can see when it was made, too: those are all 1944 sixpences, stamped into little dome shapes and threaded onto links. This being the olden days, those sixpences are 50 per cent silver. It was handmade for Frugal Grandma by an American G.I. – and making it must have taken such a long time! Sadly there is not an amazing story behind this one, as Frugal Grandma didn’t like him very much and didn’t really wear the bracelet after the war… which is how it ended up finding a new home here at Thrifty Towers. I love it. It’s a proper Make Do And Mend bracelet, isn’t it? 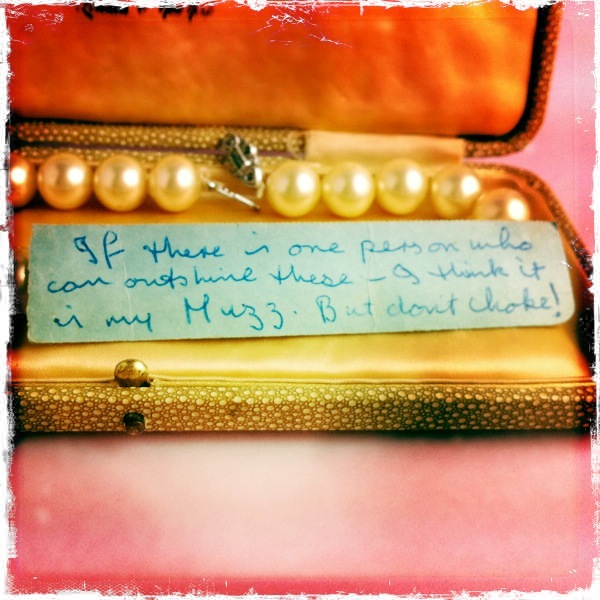 This string of pearls belonged to my late great-grandma (Frugal Grandma’s mother). 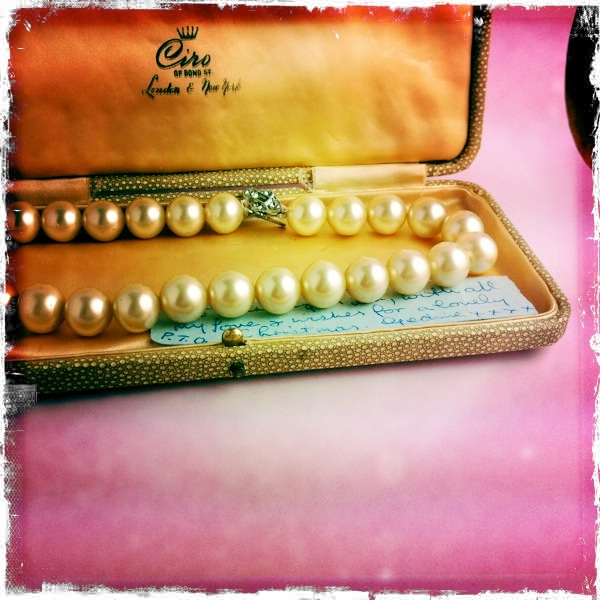 They aren’t real pearls – they’re the size of marbles! – but are in remarkably good condition, given that they are c. 60 years old. A couple of tiny scratches, and the clasp has lost its diamante, but that’s it. That’s the original padded case. 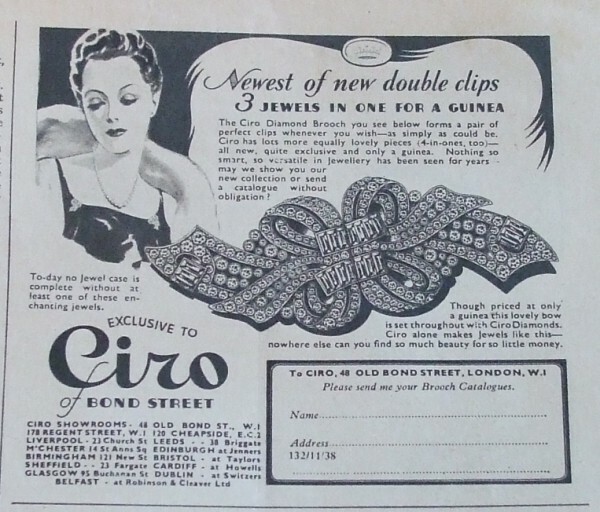 Ciro of Bond Street is still going, too. To give you an idea of dating: Ciro’s New York outlet opened in 1938. 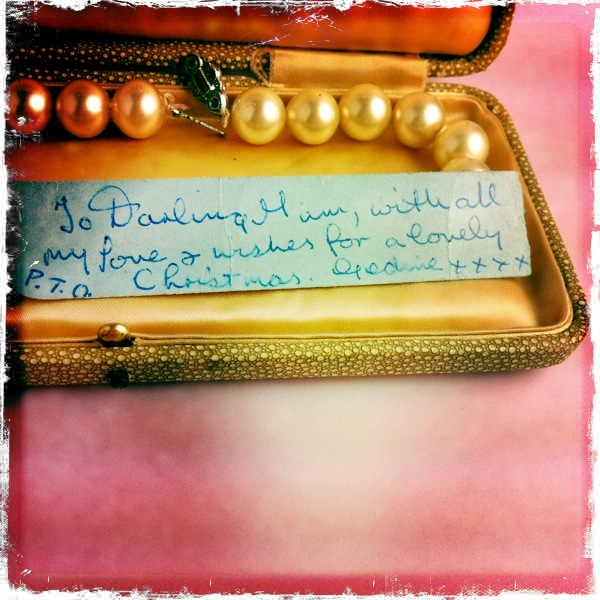 Oh, and that handwritten note you can see was scribbled by a youthful Frugal Grandma! 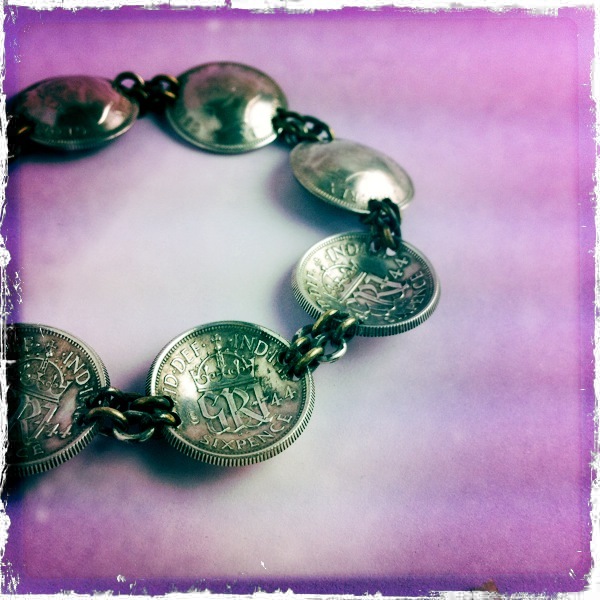 The coin bracelet is a lovely idea that I’ll just have to add to my ‘get round to making one day’ list! The bracelet is very pretty and has a lot of meaning. I even like the idea of a theme for the party. I love this party theme! I’m always looking for new party ideas & this sound like so much fun. In the US we didn’t have a Blitz of course, but a 1940s party could still be fun. The 1950s party theme has been done to death here, so it’d be great fun to try the 1940s with the jitterbug dancing & music. The 1920s is always a fun theme in the US too. Gangsters, speakeasies, flapper costumes, drinks in tea cups, etc. Prohibition had a lot of bad consequences but it makes for a great party theme! Wow amazing! I wish I had cool old jewelry and a Blitz Party to attend. Very fun.